This past weekend's Sweet Peach Revival was an incredible success and I am so thankful for everyone's time, enthusiasm and participation. I'm just blown away by the support and I loved meeting so many new people. And one of my favorite moments was our live auction, which raised $3200 for CASA. I think Beth and I are now addicted to auctions. So, for all those who participated, donated, hung out, supported -we thank you! Pics to come later in the week. Right now, I'm taking a breather and chilling on my porch swing to enjoy a bit of summer. 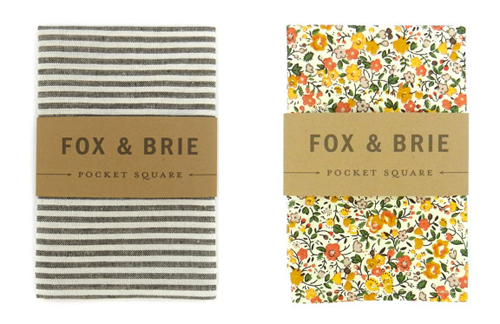 And who better to soak in the summer with than Fox & Brie? Jess Decelle started making stylish men's wear just three years ago at her home base of Austin, Texas. Within that time, she's amassed quite a following. Perhaps it's the natural fibers of her apparel items? Or maybe it's the super stylish fabric designs she chooses? Whatever it is, I'm a fan. This is pure scrumptious, manly goodness. 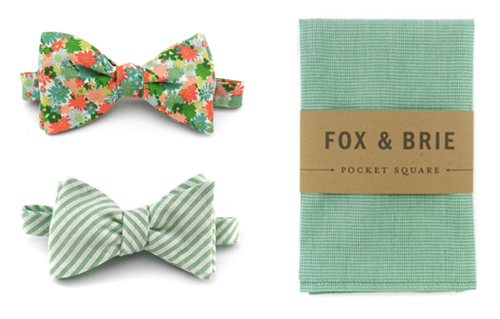 Every man should celebrate summer with a little Fox & Brie, don't you think? See all of Jess' sunny creations for the season, here.